QUEBEC CITY (CNS) — On Holy Thursday, Ann Sieben was among a few women to get their feet washed at the Basilica-Cathedral Notre-Dame. While Quebec Auxiliary Bishop Gaetan Proulx dried her foot with a towel, they exchanged a smile, both contemplating the symbol within the symbol. 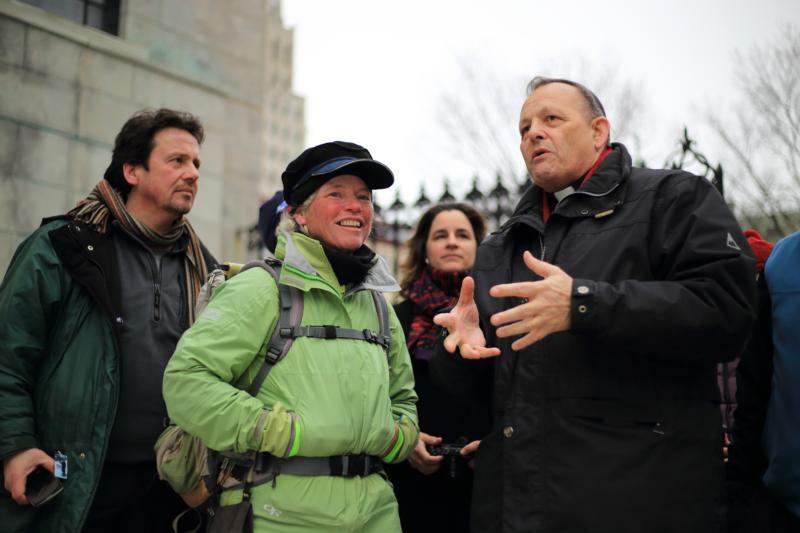 As a pilgrim, Sieben had just walked more than 3,100 miles from her hometown of Denver to Quebec City, making it just in time for the Easter triduum. That afternoon, when she reached the cathedral of the first Canadian diocese, Catholics rang the bells for her and invited her to come inside the Old Quebec landmark by walking through North America’s only Holy Door, opened for the Year of Mercy. Other pilgrimage aficionados accompanied her for this moment, and they, too, got their feet washed in the cathedral’s sanctuary that night. Sieben left Denver Nov. 1. Called the “Winter Pilgrim,” she embarked on a journey that led her through some of North America’s most iconic Catholic shrines, including the Martyrs Shrine in Midland, Ontario; St. Joseph’s Oratory in Montreal; and the shrine of Notre Dame-du-Cap in Trois Rivieres, Quebec. Her final destination — the Basilica of Ste. Anne de Beaupre, east of Quebec City — is closely related to her own family story, as her grandmother used to go there every year. This tie is why she was named Ann. “At the end there is always some trepidation,” Sieben said of her ninth pilgrimage. “I want it to be over and reach my objective, to get my completion. But I’m generally doing little circles before I get to my destination, to extend the experience a little bit more. Because it’s so great to be on a pilgrimage where every step is somewhere new. Every person I meet is somebody new, every cathedral I enter is something new. It’s so invigorating. I don’t want it to be over, but it must be over. “A pilgrim must have a destination. Without a destination, I’m a vagabond,” said Sieben, laughing. Now 52, she used to work as a nuclear engineer. She spent a few years in Europe as a consultant for various governments and companies. “You must give up your life to have your life. I gave up my life as an engineer, and I have the life of a pilgrim.” This summer, she will accompany pilgrims from Rome to Krakow, Poland, for World Youth Day. In her bag, she carries a Bible, a blanket, sandals, some extra clothes and little toiletries — no electronics, no phone. She does not have a strict itinerary and often prefers to walk in nature. She never ventures onto highways. “I’m out there alone and most of the world is not mapped. So I have to make sure I am getting to a destination every day. Every night, I want to be sleeping in a house, under a roof. So I always have to make sure I can get somewhere before night. So the day is my own to be in nature, but the late afternoon, the evenings, an hour or two before the sun goes down, I find people. I explain my life very gently: I’m a pilgrim, I need some help, I need a place to sleep tonight. I’m completely mendicant, so I have no money. I’m no tourist, so I must ask people for a place to stay, something to eat. And people always help me. They help me because of trust. And trust is the foundation of peace. This is my function as a servant pilgrim,” she said. Sieben learned French while traveling in Europe, and she found it a useful tool to connect with the population in Quebec. But she also carried another important tool: her pilgrim credentials, authenticated by Archbishop Samuel J. Aquila of Denver, signed and stamped in the various places where she stopped along the way. “I’m a servant pilgrim. I go to actively build trust. These credentials are a big support in building trust,” she explained, taking out the long parchment-like document and holding it with her arms stretched apart. Since November, the areas where she walked were hit by snowstorms, strong winds and freezing rain. However bad the weather is, she said there’s never a dark day during her pilgrimages. Even when she walked across North Africa during the Arab Spring a few years ago, when she was caught between gunfights and explosions, she said she was “annoyed” but did not despair.